While not all U.S. companies understand social media as a viable communication tool to reach American consumers, other countries seem to be on the front end of understanding it well enough. The Brazilian Tourist Board, EMBRATUR, is offering Americans who travel to Brazil the chance to participate in an essay and photo contest. Entries will be accepted through November 21 and judged by Peter Guttman, a photographer, writer, and author who traveled on assignment to more than 200 countries. He recently returned from assignment in the Brazilian Amazon. 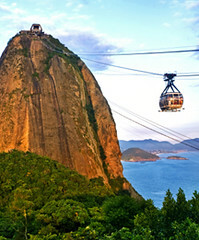 Despite economic worries in the United States, Brazil experienced a 9.6 percent increase in American tourism last year. And, according to the Office of Travel and Tourism Industries, American visitations to South America is still up 5.7 percent, a growth rate that is on pace with the Caribbean for the first time. While the photo contest Web site interface is notably clunky, the concept still represents a step in the right direction. Most Americans might be passive about creating their own blogs, but an increasing number of them are very interested in participating on platforms managed by someone else. So what might we do differently? We'd move the consumer marketing concept to the next step by running a photo blog that highlights one photo pick per day. It would give entrants a chance to check the status of their photos and Brazil enthusiasts a reason to return, over and over again. The top entry will receive an all-expenses-paid return trip for two to Brazil.